There was a time in my life where my favorite books to read were about how to be a writer. Ironically, also during most of this time, I was not writing. I just so enjoyed reading about HOW to write that I had no time for actual writing! 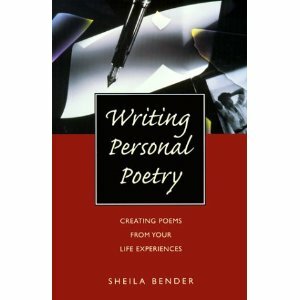 But one book that ACTUALLY made me start writing again (this was after graduating college when I had no more "deadlines" hanging over my head), was Sheila Bender's book Writing Personal Poetry. Although I'm actually a fan of form poetry and formal styles, Bender's book brought me to a place where I could write just from my own experiences. Which I previously thought too ordinary for poetry. Bender walks you through steps including even WHY to write personal poetry and how to give yourself the nudge to go ahead and write. She talks about what makes good poetry (and it isn't the going on and on about your personal grievances or sappy love stuff!). She discusses my favorite topic - using mentor texts to inspire your own writing (reading poetry to help you write poetry!). And uses good sense when it comes to discussing author's craft - including not generalizing, not using elevated speech (purple prose that I hate so much! ), not simply categorizing or summarizing a feeling as if you're writing a news article. LOVE her discussion of being specific and using the five senses to bring the reader into the NOW. Best of all, she has several times throughout the book where she shows an example poem "progressing" through several drafts, so you get to see the poem take shape and become more specific, more personal. Bender's book is also actually FUN to read because the writing style isn't heavy or technical in nature. I really enjoyed reading her advice, tips, examples and sample poems from herself, well-known poets, and students of hers! A book worth getting if you're new to poetry, or looking to rejuvenate yourself! Do you have any writing / poetry writing book recommendations to share?